Even though summer is quickly coming to an end, it doesn’t mean you have to give up burger season quite yet. I know plenty of people getting ready to close out the season with some great backyard BBQ’s filled with the classic burger, beer and brats menu. But what happens when you plan a great picnic and realize you have a few non-meat eating guests coming to the party? Before you run to the freezer aisle to scope out the frozen veggie burgers, why not surprise your guests with a meat-free burger that is not only easy and healthy, but may just turn any veggie burger skeptic into a believer. 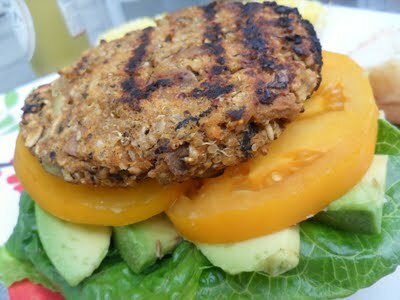 These Sweet Potato Black Bean Burgers are one of my favorite vegetarian dishes for summer. You can prep them ahead of time so that they can easily go into the oven before guests arrive. They also freeze well so don’t be afraid to make a double batch to have some on hand for the fall months. Who says burgers are only a summer food? Preheat your oven to 375* once you finish cooking the quinoa + potato. Mash half of the beans in a bowl until paste-like. Add in the rest of the beans and give a very light stir/mash to combine. In a large bowl, mash the sweet tater. Each cube should be mashed, but you don’t want it creamy. Stir in the salt, pepper, oregano, chili powder, cayenne and olive oil, until combined. Mix in the onion, garlic, black beans, quinoa, sunflower seeds, and ground oats, until just combined. Taste, and adjust seasonings to your liking. Form into balls, between your hands and flatten into 1/2”-3/4” thick patties. This should make 8 medium/large patties.